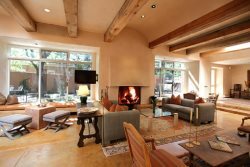 This stunning home is located in Wilderness Gate in the foothills of Santa Fe. Built in 2008, Casa Makowa was designed with views in mind. From the home, you can enjoy views of the city lights from Santa Fe, sunsets over the Jemez Mountain range as well as the majestic Ortiz and Sandia Mountains to the south. Published in House Beautiful magazine, this property was decorated by local Santa Fe designer Emily Henry who embraced both a local Santa Fe aesthetic as well as a more contemporary look. The home's art collection includes photography from the owners travels around the world. The living room opens to a huge portal with outdoor patio furniture and a fire pit. The formal dining room offers more views to the west and a fireplace which opens to the gourmet kitchen that has access to the portal and BBQ. The luxurious master bedroom is very inviting with a cozy kiva fireplace, a desk for checking emails and views to the south and west. The master bathroom offers a whirlpool tub, a stand up shower and a double sink vanity. The guest bedrooms are beautifully appointed with artwork, photography, luxurious linens and en suite bathrooms. Approximately 2,800 net square feet. There is a 30 day minimum reservation required.